The Ducks are going dancing as the No. 8 seed in the Western Regional and are facing a familiar foe in Oklahoma State, who they triumphed over in the first round of the 2013 tournament only to fall to Wisconsin in their second game. A repeat performance has been predicted by ESPN bracketologist Joe Lunardi. Bell has the second most blocks as a freshman in NCAA history. While overwhelming confidence may not be coming from most of the country, the Ducks surely believe that they are more than a team with a single great player and “replacement parts.” Freshman Jordan Bell has certainly made his presence felt setting an Oregon single season record with 86 blocked shots. Bell is 22nd in the nation in blocked shots and averages nearly three per game. In addition to keeping opponents away from the basket, he also leads the team with 6.1 rebounds per game. Bell is not the only freshman who has helped carry a team to the dance this year that was predicted to finish eighth in the Pac-12 . Dillon Brooks has fought his way into the starting lineup by scoring 11.5 points per game and pulling in nearly five rebounds per game. Both Bell and Brooks have been selected to the Pac-12 All-Freshman team. 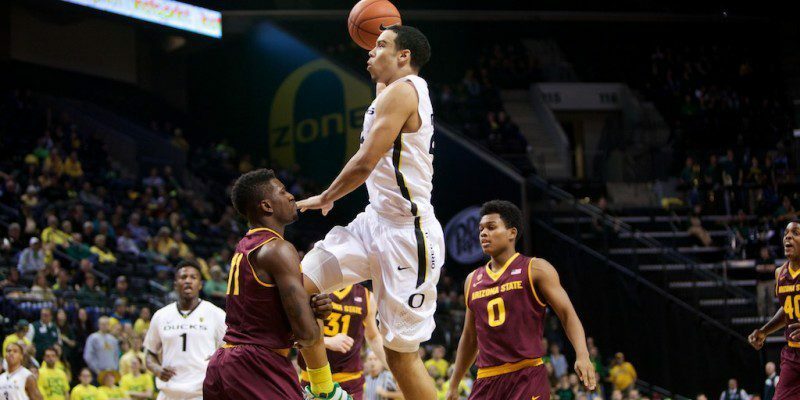 Despite the youth of Altman’s squad the Ducks are ranked 24th in the country in scoring. And while Oregon’s inexperience could catch up with them, their youthful exuberance and passion could be the catalyst that pushes Oregon higher than anyone expects to see them fly. This season’s team may not be what we expected to see, given the results of last season, but they have made their mark and aren’t showing any signs of backing down now. Dana AltmanDILLON BROOKSEamonn BrennanJoe LunardiJordan BellOregon BasketballOregon vs. Oklahoma St.